Jeremy Corbyn’s pro-Brexit stance risks up to 45 seats at the next election, secret research for a major trade union claims. Leaks from surveys done for the TSSA union suggest switching to a full pro-EU position would also cost seats – but just 11. The details from the report do not reveal which seats Mr Corbyn stands to lose with a change of tack. It is likely to be focused on heavily pro-Remain seats where votes could switch to the Liberal Democrats if Mr Corbyn helps deliver Brexit. There are constituencies in the north of England and parts of Wales where Brexit voters deserting Labour could boost the Tories. 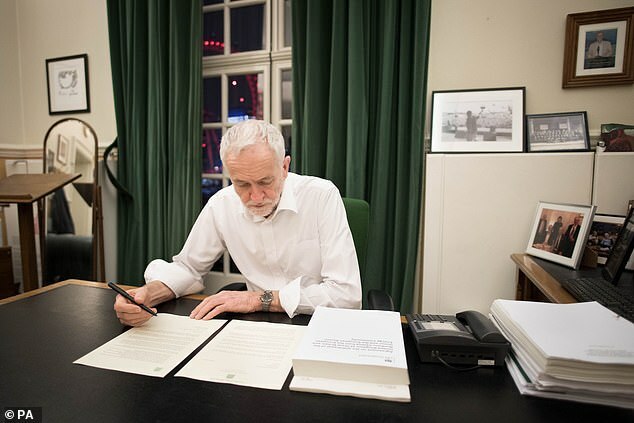 Mr Corbyn finally shifted his stance on Brexit last night, writing to Theresa May to outline changes to the plans for the future trade deal that could win Labour votes for the divorce deal. Revealed by ITV’s Robert Peston, the research concludes: ‘There can be no disguising the sense of disappointment and disillusionment with Labour if it fails to oppose Brexit and there is every indication that it will be far more damaging to the party’s electoral fortunes than the Iraq war. ‘Labour would especially lose the support of people below the age of 35. which could make this issue comparable to to impact the tuition fees and involvement in coalition had on Lib Dem support’. It warns ‘if Labour supports implementation of Brexit it would lose a further 45 seats’ but would only lose ‘a further 11 seats’ if it opposes leaving the EU. The polling shows ’17 per cent of Labour’s 2017 vote would be ”very likely” to support a new centrist party committed to opposing or overturning Brexit. Another 27 per cent say they would be ”fairly likely” to support a new centrist party’. The Labour leader made his move in a letter to the PM setting out his revised conditions for backing a deal – including a permanent customs union and close alignment to the single market. Tory former minister Nick Boles welcomed the overture as a ‘big step to a cross-party compromise’ based on an enhanced Norway model. But Mr Corbyn’s terms – which crucially drop his previous call for her to secure the ‘exact same benefits’ as current membership – enraged Labour Remainers who accused him of ‘enabling’ Brexit. Fresh splits also emerged in Mr Corbyn’s frontbench team as shadow Brexit minister Matthew Pennycook said the party ‘must move to support a public vote’ unless Mrs May accepts the conditions ‘in full’. 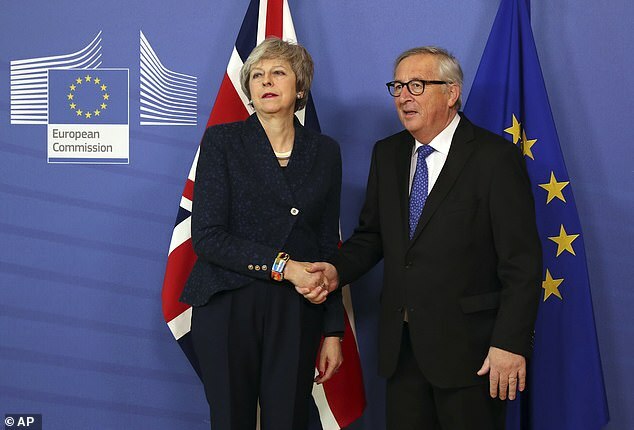 The intervention came as Mrs May headed to Brussels for the latest round of talks to wring more concessions on the Irish border backstop. It could further undermine her position, by persuading the EU it does not need to give ground. In the letter to the PM, which follows their Brexit meeting last week, Mr Corbyn called for a ‘permanent and comprehensive UK-wide customs union’.